The 21-year-old claims Ireland’s fourth medal of the day. 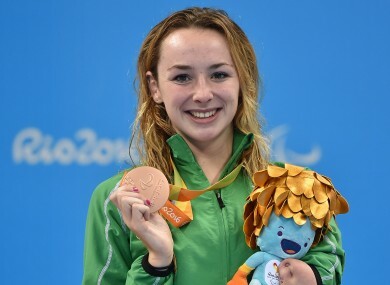 ELLEN KEANE COMPLETED the most remarkable day for Ireland as she won her first Paralympic medal, claiming bronze in the SB8 100m breaststroke. The 21-year-old from Dublin came home in third in a time of 1:23.07, sparking jubilant celebrations from her family inside Rio’s Olympic Aquatic Centre. Canada’s Katarina Roxon, the pre-race favourite, stormed to victory in 1:19.44 while Claire Cashmore of Great Britain won silver. “I’m a bit emotional, I think I’m a bit in shock,” Keane said. “When I finished I didn’t think I’d won a medal and then I looked up and saw the three. I was looking at the numbers frantically. I couldn’t believe it. “Then I saw one of my best friends won the gold as well, I was delighted for her. In the call-room it was a bit intense, no one was talking it but just before we went out me and Kat had a hug and a kiss because I’ve known her all my life. “I swam against her in Beijing when she was 15 and I was 13 so I’m so proud that she won the medal. Email “Ellen Keane produces the performance of her life to win bronze in the pool”. Feedback on “Ellen Keane produces the performance of her life to win bronze in the pool”.